Oncology is dominating both interest from buyers and sellers in the marketplace, according to Neel Patel, Managing Director at Campbell Alliance, an inVenitv Health Company. 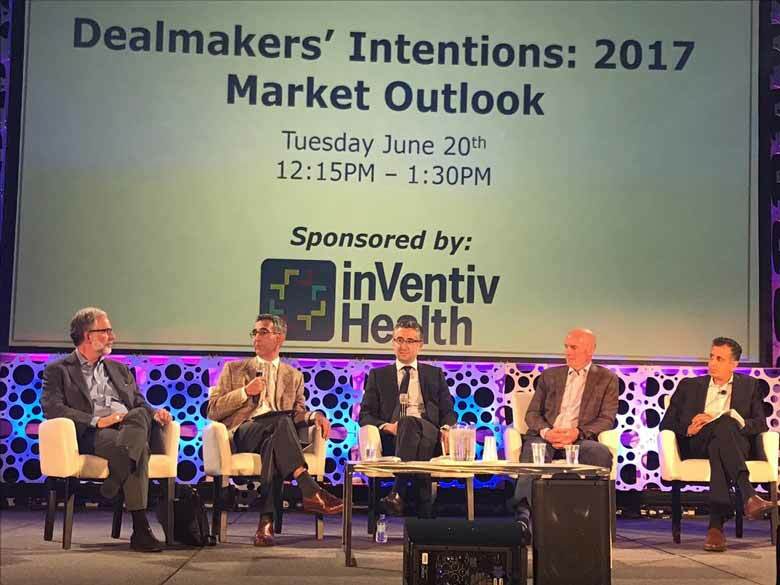 That was one of the big takeaways from BIO's Tuesday Dealmakers’ Intentions: 2017 Market Outlook session. “It’s not surprising to see the focus on oncology,” Dr. Paul Biondi, head of Business Development, Bristol-Myers Squibb, said. “It’s an incredibly exciting time. We see the possibilities of doing multiple transactions to continue to bolster opportunities,” Dr. Biondi said. Daniel Karp, Vice President, World Business Development at Pfizer, said the areas his group is focusing on, are vaccines, oncology, rare diseases, inflammation, immunology and neurodegenerative disease and metabolic disease. Pfizer also looks for investments that intersect and build on its current brands or anchor programs, Mr. Karp added. Patrick Verheyen, Global Head of Janssen Business Development, of Johnson and Johnson, said he gravitate towards areas in which J&J has a deep scientific knowledge. “We tend to make investments where we have a lot of expertise. It would be dangerous to get too excited about opportunities outside your expertise too quickly,” he said. Bob Carey, Executive Vice-President, Horizon Pharma PLC, said his company wants to build up the orphan business. “We see a lot of increasing competition. We’re were relatively agnostic within the areas of orphan, with the exception of oncology,” Mr. Carey said. Expect to also see an increase in small and mid-size deals as opposed to the mega deals, according to all of the panelists. The political climate - uncertainty surrounding the Affordable Care Act, interest rates, and potential changes to the tax code - is contributing to the reluctance to enter into the larger deals. “Stability is important for mega deals,” Mr. Karp said. Often, decisions are made in the margins, Mr. Carey added. “We’ve looked at different impacts of tax policy and it throws a lot of transactions into doable and not doable,” he said. That’s not to say the big deals won’t happen. Mr. Verheyen talked about some of the details of Johnson and Johnson’s acquisition of Actelion in a $30 billion deal that was completed last week. According to Mr. Patel’s analysis, it is still a seller’s market. “It may not feel like it if you’re the one looking to license your technology,” he said. But the outlook is good, especially for companies in the right phase and the right therapeutic area. 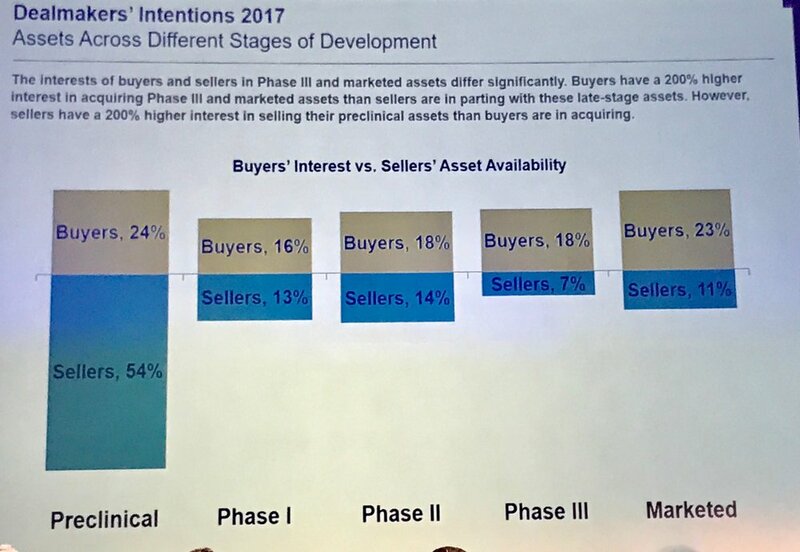 For example, there are more buyers than sellers in Phase II, Phase III and of course, in an already marketed asset. The panelists closed the session with their assessment of risk - were they willing to take more or less these days in the deals they made? “We’re all in the business of risk,” Dr. Biondi said. Mr. Karp said it is integral to build a deal structure that mitigates the risks.